We’d love your help. Let us know what’s wrong with this preview of Princess Ramona, Beloved of Beasts by Ruth Gilmore Ingulsrud. 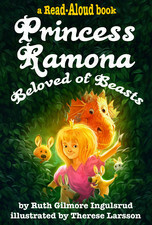 To ask other readers questions about Princess Ramona, Beloved of Beasts, please sign up. In Ramona’s kingdom, someone is stealing and plundering the food supply. In his fury, the King decides that the only way to discover the culprit is to cage all the animals. Ramona does not agree and sets about releasing all the animals. The King banishes Ramona for freeing them. While she is away, she happens upon a huge dragon. She realizes that it is the dragon who has been eating everyone out of house and home. She sets about to show him the error of his ways. The tale is told in rhyme, and t In Ramona’s kingdom, someone is stealing and plundering the food supply. In his fury, the King decides that the only way to discover the culprit is to cage all the animals. Ramona does not agree and sets about releasing all the animals. The King banishes Ramona for freeing them. While she is away, she happens upon a huge dragon. She realizes that it is the dragon who has been eating everyone out of house and home. She sets about to show him the error of his ways. The tale is told in rhyme, and that, along with the brilliantly created drawings, will hold your child’s attention. The book can be downloaded as a ‘read to me’ book in iTunes. You will absolutely love it!